Daniel H. Pink has 1 media appearance. 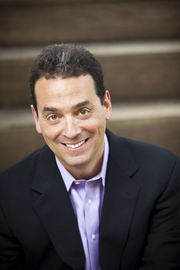 Daniel H. Pink discusses Free Agent Nation: The Future of Working for Yourself. 11:30 am Reception, 12 noon Luncheon DANIEL PINK To Sell is Human: The Surprising Truth About Moving Others Provocative author, business thinker, and Northwestern grad Pink talks about his new #1 bestseller, offering a fresh look at the art and science of sales. Using a mix of social science, survey research, and stories, he shows that white-collar workers spend an enormous portion of their time persuading, influencing, and moving others—and then reveals the three personal qualities and three specific skills necessary for doing it better. According to the U.S. Bureau of Labor Statistics, one in nine Americans work in sales. But so do the other eight. Whether we're employees pitching colleagues on a new idea, entrepreneurs enticing funders to invest, or parents and teachers cajoling children to study, we spend our days trying to move others. Daniel Pink will speak about the art and science of sales and his book, To Sell is Human, at a luncheon sponsored by Maryville Talks Books. Tickets are $20-45 and are available at danpink.brownpapertickets.com. Daniel H. Pink is currently considered a "single author." If one or more works are by a distinct, homonymous authors, go ahead and split the author. Daniel H. Pink is composed of 6 names. You can examine and separate out names.